A concentrated effort to investigate the source of the "not as good as expected" image quality at the periphery of the MegaPrime field started in early June 2004. With MegaCam now operational in a nice "cruising" mode, with most of the MegaPrime features implemented, and with the MegaPrime optics aligned as well as possible, time has come for this concentrated effort. A small task force has been created at CFHT, with Greg Barrick, Tom Benedict and Derrick Salmon as the main players, Derrick leading the group. Many individuals, in house and in the CFHT community, will participate in the process. This web page will share with all those interested in the MPIQI the progress of the investigation. This project has been given top priority at CFHT, following the clear recommendation of the Scientific Advisory Council. A detector plane tilt in the NW/SE direction was removed on September 20, 2005 by tipping the MegaCam camera by 0.00037 radians. The resulting image quality, as is evident in the first iq 'video' below, is very nearly optimal. The first movie shows 9 consecutive 1 minute exposures taken with the 'z' filter on the night of October 9/10, 2005. 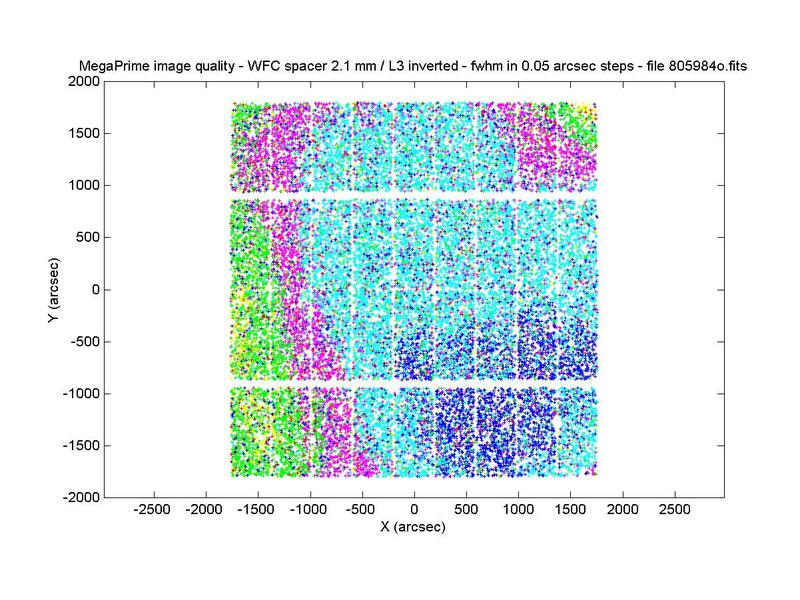 On the right are plots of image fwhm versus field radius for all stars identified by two software packages; Sextractor and Fit Moffat. The fwhm frequency distribution for both are plotted at the lower right. Substantial differences exist in the extracted fwhm values provided by these packages for these slightly undersampled images. Although radial IQ plots are not the best diagnostic tool, they do provide a very succinct means of establishing the presence of field-dependent problems. As an example, after comparison with the focus movie below, the concave upward radial distribution indicates that these images were likely taken with the camera located slightly above optimal focus. The second video shows data on image ellipticity for the same images as in the first video. The strong banding of ellipticity position angle for images with the worst radial iq plots and the largest iq degradation on the left (East) side of the array again points to a possible combined effect of a residual detector tilt, a curved focal surface and a slight defocus. The third video shows the evolution of image quality with focus. Seven sets of four consecutive images each are displayed. After each set of four - all taken at the same focus - a 100 micron downward focus offset was applied. The effects of very slight ccd-to-ccd focus offsets and tilts (at the 10 micron level and below) and the non-planar shape of the optical focal surface are clearly evident. These images have also been helpful in tracking down the source of image-to-image iq variability. Of the four exposures taken at each focus position, the first two used the MegaPrime shutter to start and stop the exposures. For the third and fourth exposure no shutter action was involved. That there is no evident correlation of iq variability with shutter / no shutter operation strongly suggests that torque variations to shutter operation are not a likely cause of iq variability. Likewise, the apparent stability of the slight tilts and focus offsets between ccd's evident at large defocus suggests that ccd-to-ccd geometry is very stable and therefore not a likely source of instability. Remaining tests include checks of the possible influences of pulse tube operation and ISU action on iq stability. The separation between the primary mirror and the body of the wide-field corrector was increased by 3.4 mm (we were looking for a change anywhere between 3 and 4 mm) on July 26, 2005 prior to the start of the July 28 - August 11, MegaPrime observing run. L3 remains in its inverted orientation. This action was taken at the end/start of the semester to minimize the impact of image quality changes on observing programs. A representative plot of the achieved radial image quality distribution and a corresponding image quality field map are provided in Figure 1-July and Figure 2-July. The rapid iq deterioration previously evident at large field angles has largely been removed, although significant field-dependant variations remain. Any further refinement of corrector-to-primary mirror separation will require consideration of day-to-day temperature variations at the telescope since, over the course of a year, these can result in more than a 1.0mm separation change. 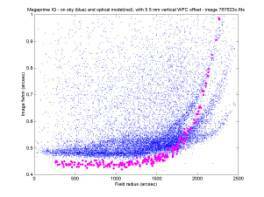 The iq distributed is variable with time as demonstrated in the pair of GIF movies below. Each movie consists of a series of 48 consecutive 3 minute exposures; frames 805983o.fits through 806030o.fits. The frames are NOT of a single field. Rather, sixteen separate fields within a small region of the sky were imaged succesively. The series of sixteen was then repeated twice more to obtain the 48 exposures. During this series, which lasted roughly 3 hours, the telescope was refocused 10 times. In the movie, Figure 3-July below, focus changes are identified by a change in the background color. Focus moved monitonically upward in roughly 30 micron steps. Although there are large iq changes from frame to frame, these do not appear to correlate well with changes of the MegaPrime focus setting. The second movie, Figure 4-July, on the left shows a series of iq maps with fwhm encoded in steps of 0.05 arcseconds (b, c, m, g, y, r, b, c, m, g, y r, b from <0.45 to >1.0 arcseconds). 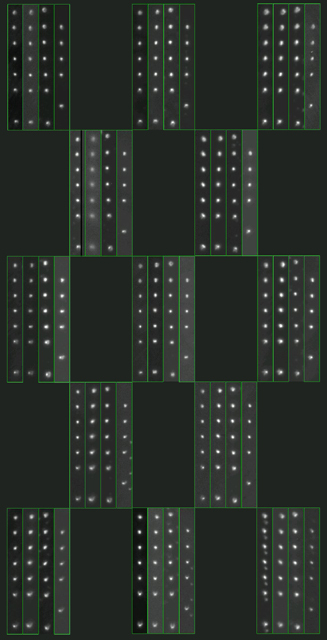 To the right are radial iq maps for each of the four CCD array quadrants with field radius measured from the center of the CCD array, not from the quadrant centers. We are in the process of instrumenting the primary mirror and other parts of the telescope to determine if changes of iq distribution can be correlated with a change in mirror position. 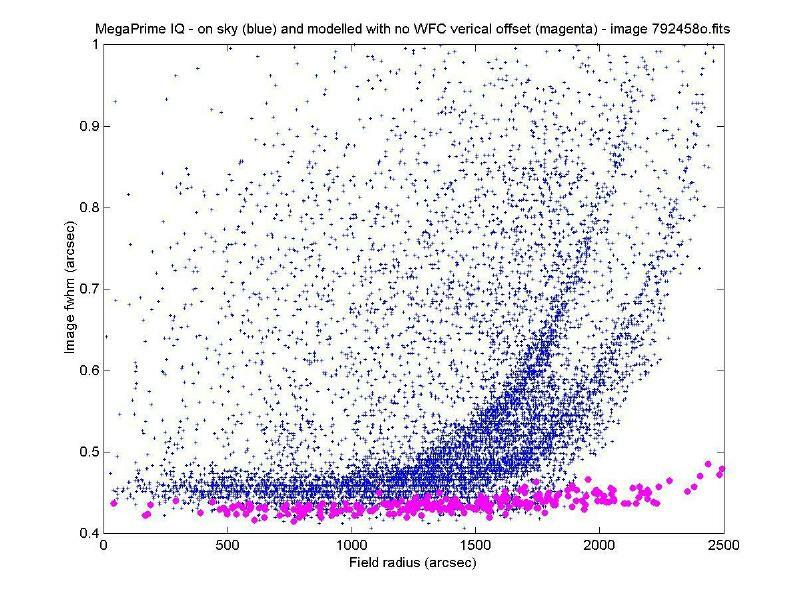 We know from a MegaPrime focus model developed from on-sky focus exposures that unexplained focus changes are not likely to be larger than 100 microns. 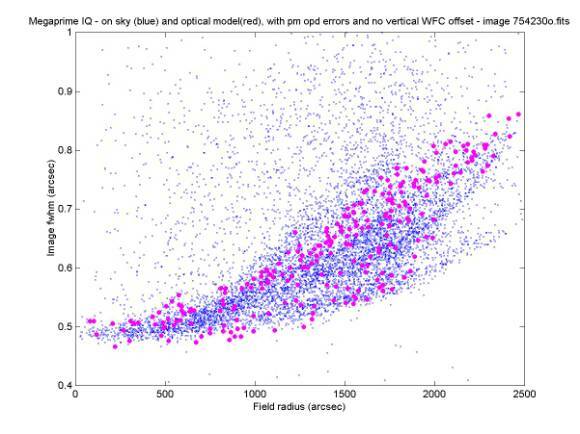 A plot of the width of the iq distribution for this image series at r = 1800 arcsec versus time, together with image fwhm and temperature is provided in Figure 5-July. In these plots, vertical lines indicate the times at which telescope focus was updated. 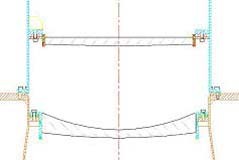 We are re-examining the possible role played by MegaCam shutter actuation in producing these changes.. Note that a consistent broad 'valley' of good image quality extends from upper left (north-east on the sky) to lower right (south-west on the sky). Poorer images to the north-west and south-east can partly be explained by a ± 64 micron focal plane tilt in this direction, evident in the focus frame 805982x.fits. 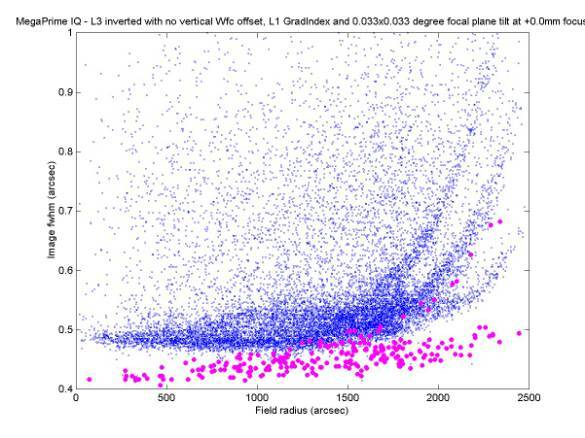 Figure 5 - July - Plots of the width of i) the iq distribution at a field radius of 1800 arcseconds, ii) image fwhm and iii) telescope truss temperature for a series of 48 exposures on the night of July 30/31, 2005. Because of heavy WIRCam staff loads and severe limitation on observing time due to exceptionally poor weather this winter, we have not attempted any modifications to the wide-field corrector or its alignment over the past six months. Nonetheless, considerable effort has been made towards understanding the origin of off-axis image quality degradation and the reasons for improved image quality with lens L3 inverted. Despite these efforts, only limited insight has been gained. Lens L3 has been positioned on short standoffs in its inverted orientation for all observing runs starting in December 2004. A plot of image quality versus field radius in this configuration is provided in Figure 1. 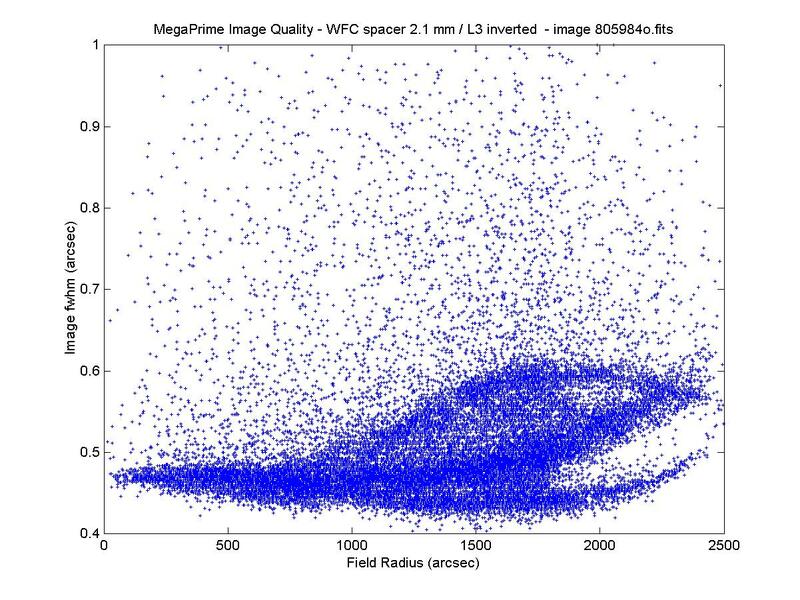 Figure 1 – MegaPrime image fwhm versus field radius: blue dots - measured image size with lens L3 inverted; red circles – expected image size with lens L3 in its design (not inverted) orientation, and seeing of 0.40 arcsec. Imaging performance with lens L3 inverted provides a strong constraint for the development of optical models that account for image quality in both the L3-inverted and initial design configurations. To date we have been unable to develop a model that accounts consistently for both these configurations, although we have seen results which are tantalizingly close. 1. Comparison of observed and modeled imaging performance. 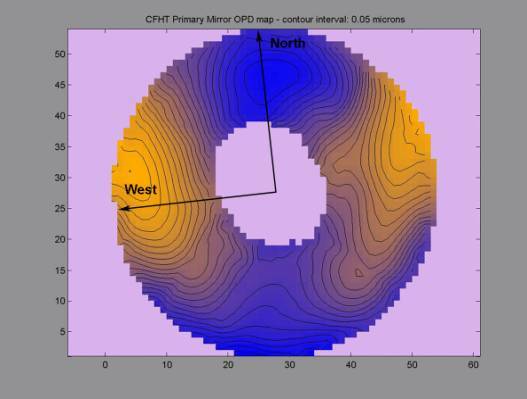 In early January we characterized primary mirror wavefront errors using Shack-Hartmann data taken at the telescope in November, 2004 and included these, with correct rotational orientation, in MegaPrime optical models. The primary mirror wavefront is shown in Figure 2 together with synthetic and real through-focus images. Figure 3 is a plot of image quality versus field radius using both synthetic star images derived from the optical model and real image data. If these were the only data available we would likely have assumed that image quality deterioration at large field radii had been accounted for, and not taken the investigation further. through-focus images synthesized from the wavefront and observed on the sky. map approximates the true primary mirror, but is not a perfect match. the effects of primary mirror wavefront errors. However,we have data taken with lens L3 inverted. A plot of sythetic and observed image quality in this configuration is provided in Figure 4. Agreement is not good, and therefore neither is the optical model. in at least one of the fundamental optical parameters of the system. 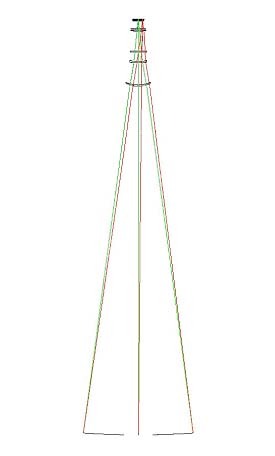 If we were to (rashly) assume that the observed image quality with lens L3 inverted somehow returns the corrector to its design imaging performance, then the strong tails seen at large field radius can be partially accounted for by a de-space error between the primary mirror and the corrector. Similarly, the splitting of the image quality distribution can be accounted for by including a focal plane tilt and/or a decentering of the wide field corrector, as demonstrated in Figures 5 and 6.
toward the primary mirror (right). results obtained on other models with focal plane tilts. 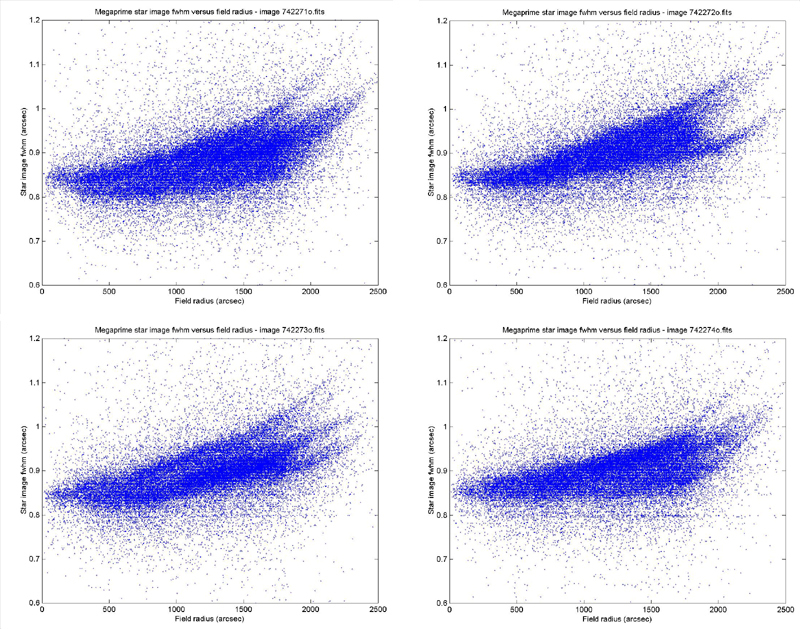 Although the plots for de-space error and focal plane tilt are suggestive, they are by no means definitive – other errors may lead to similar results. We hope to test the effects of changes to corrector alignment with lens L3 inverted at the end of semester 2005A or the start of 2005B – a time which should permit the MegaPrime optical configuration to remain undisturbed for the largest possible fraction of a semester. 2. Effects of optical model re-optimization with lens L3 inverted. To explain the improved image quality with lens L3 inverted seems to require an error in at least one of the fundamental parameter of the MegaPrime optical train. Early in our modeling effort we examined the changes in optical parameters needed to account for this unexpected improvement. The results are summarized in Table 1 which lists the effects of changes of lens surface radii, conic constants and refraction indices for lenses L1, L2 and L3 and the conic constant of the primary mirror, all with lens L3 inverted. Each entry in the table includes, first, the re-optimized optical model merit function (smaller values are better), followed by the design value of the parameter being optimized, the re-optimized value and the percentage change after optimization. Entries with a small merit function combined with a small percentage change suggest a parameter worthy of further investigation. Several conclusions based on Table 1 are worth noting. First, an error in the conic constant (spherical aberration contribution) for the primary mirror will not explain the improved imaging performance with lens L3 inverted. The merit further is too large, as are the associated images at large field angles. Second, errors in the refractive indices of lenses L1, L2 and L3 are unlikely sources of the improved performance since large changes in refraction index (at the 0.45% level) would be needed. These far exceed expected errors. Again, the resulting merit functions are not particularly good. Third, the large merit function for all changes in lens L3 (except CC1) rule this lens out. (The conic constant on surface 1 of lens L3 needed to obtain improved imaging performance - 19.9963 - pretty well eliminates lens L3 from consideration). Similarly, although not as extreme, the change in conic constant for lens L2, surface 1 is larger than should reasonably be expected. We are left with possible contributions from changes in the front radii of either lens L1 or lens L2 or the radius of surface 2 of lens L2. We continue to explore these possibilities as well as investigating the effects of a possible index gradient in lens L1. Image quality improved significantly over the central 1 degree field for a brief period in November, 2004 and was stabilized in this configuration starting with the December, 2004 MegaPrime run. 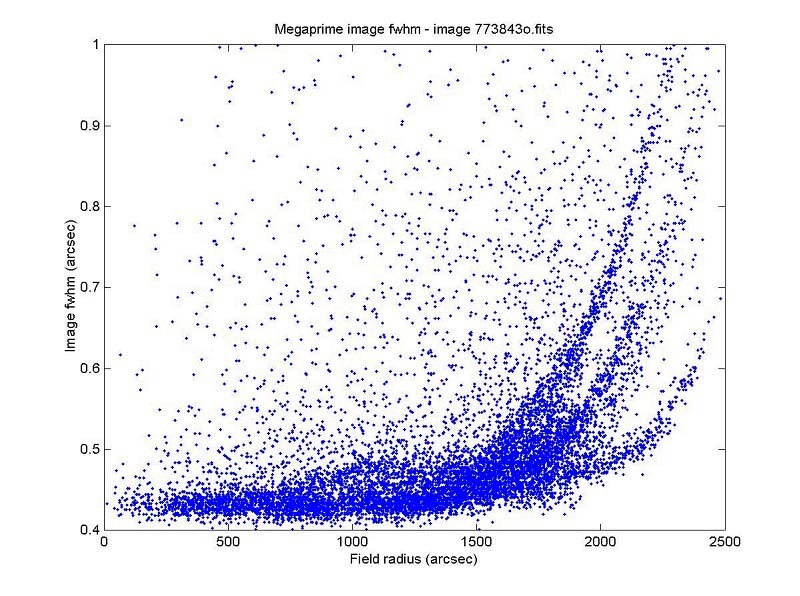 A plot of star image full widths at half maxima versus field radius is provided in Figure 7. 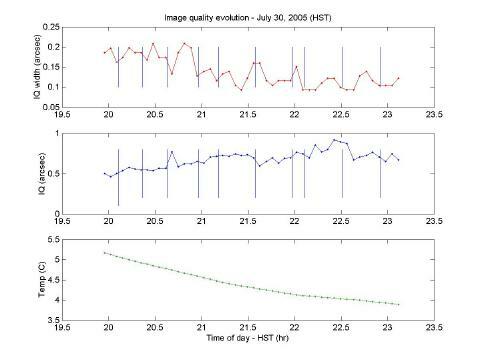 For comparison, image quality prior to December, 2004 can be seen in Figure 9. 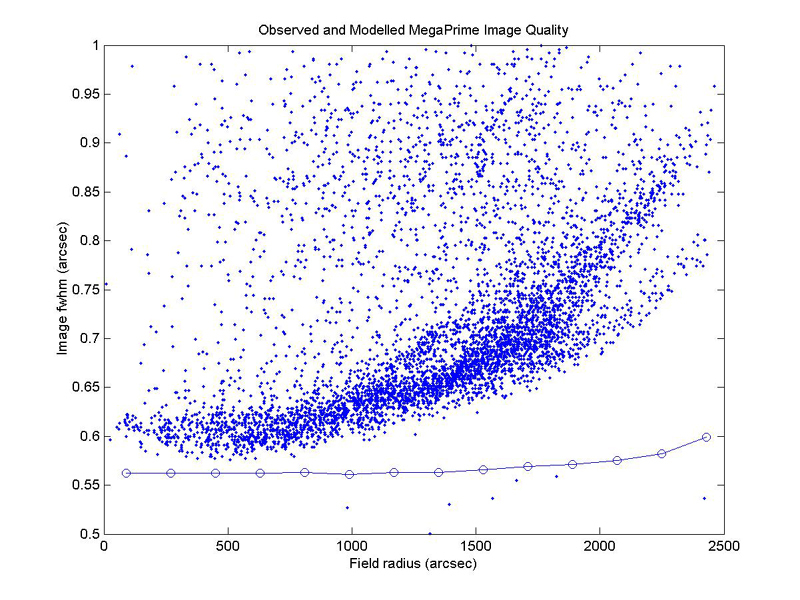 Figure 7 - MegaPrime image quality starting December, 2004. Image size is excellent except at the corners of the array where iq degrades rapidly once outside the central inscribed 1 degree field diameter. The four steep tails in the iq distribution seen on the right side of Figure 7 come from each of the corners of the MegaCam array, and indicate that iq differs significantly between the corners. The likely origin of these differences is optical misalignment. The source of the image improvement is the inadvertent mounting of lens L3 and its cell in an inverted orientation in the wide field corrector body at the end of corrector lab tests in late November, 2004. Why inverting this lens results in improved image performance is not clear, was not expected, and is the focus of much effort and speculation at the moment. We suspect that the cause is unexplained power or spherical aberration introduced by either Lens L1 or L2. We have checked that L3 is glued in its cell with the correct orientation, and that the cell was previously mounted correctly in the corrector body. We have also checked, using a precision 3-D measuring engine, that lens spacings and thicknesses correspond, to within a hundred microns or so, to our as-built optical model, and have checked lens surface radii, although to limited precision, using a spherometer. So far, there is no clearly identified smoking gun to explains these iq anomalies. Diagrams showing the ‘correct’ (per design) and ‘inverted’ orientation of L3 in the corrector body are provided in Figure 2. L3 is a very weak plano-convex optic which we tried hard to eliminate, without success, during initial corrector design. Inversion of L3 and its cell also moved this lens 28 mm closer to the L1 (the front of the corrector) and resulted in a 4.7 mm downward focus shift which exceeded the range of available focus travel for some filters and thus precluded its continued use in this orientation during the November MegaPrime observing run. The focus travel limitation was solved in time for the start of the December observations. Figure 8 – Detail of MegaPrime optics. 8a – Wide field corrector and primary mirror. 8b – Wide field corrector optics. From bottom to top, optics are L1, L2, L3, L4, the image stabilizing plate, an optical filter, a thick (25 mm) cryovessel window and the CCD detector mosaic. 8c,d – Lenses L2 (bottom) and L3 (top) showing L3 and cell in their ‘design’ and ‘inverted’ orientations. A more detailed discussion of the current understanding of MegaPrime image quality issues will be provided here shortly. The MegaPrime wide-field corrector was designed to provide star images limited in size primarily by atmospheric turbulence over most of its 1.4 degree field of view on all but the very best of nights. Contributions to image full-width-at-half-maximum (fwhm) due to the optical system were not expected to exceed 0.35 arcseconds except at the edges of the field of view. Under conditions of 0.5 arcsecond natural seeing, the MegaPrime optical system, when performing ideally, should therefore provide images with just over 0.6 arcsecond fwhm except in the extreme corners. Currently, however, image quality degrades more or less steadily from field center to edge to a degree which calls for remedial action. On the best nights, on-axis images have a fwhm of 0.6 arcsec but trend to 0.9 arcsec near the field boundaries. Ideal and measured long exposure imaging observed performance is shown graphically in Figure 9 where image fwhm for one particular exposure and ideal performance are plotted against field radius. The breadth of the fwhm distribution results from the fact that image quality varies significantly as a function of azimuth in the field. A mosaic of individual star images at selected points in the MegaCam field as the camera passes through focus is provided in Figure 10. Figure 9 - MegaPrime image fwhm. Expected performance is shown as a solid line with circles. Measured values from a typical exposure are shown as individual blue dots. Figure 10 - Star images across the MegaPrime field as of July 2004.
corresponding locations on the MegaCam CCD array. Each vertical box measures 5 arcseconds wide. A high-resolution full-size image is available here. In addition to the long-exposure image quality problems noted above, Chris Pritchet has recently demonstrated that plots of fwhm versus field radius for successive, otherwise identical, 30 second exposures show considerable variations in image size over the field. Examples of the effect can be seen in Figure 11. Although opto-mechanical instabilities were initially suspected to be the root cause of these unexpected changes, our current belief is that these variations are a result of an interplay between dynamic atmospheric turbulence, static, non-axially-symetric MegaPrime optical aberrations and the software used to calculate image fwhm data. A report on these effects and on efforts to explain them is available here. Figure 11 - Plots of image fwhm versus field radius showing variations in image size distribution over the field between successive, otherwise identical, 30 second exposures. There may remain some simple steps we can take to try to solve the image quality problem. Barring a quick solution, which we do not expect at this point, we plan first to identify the optical element(s) which contribute significantly to image quality degradation, to characterize the specific causes of the problem, and then implement corrective action. Several classical optical evaluation tools are at our disposal. These include inspection of focused and defocused images, Hartmann and knife-edge tests, cross-polorized stress birefringent tests, interferometry and evaluation of the mechanical systems involved in the mounting of lenses in corrector. The order and manner in which these tools will be applied will depend largely on what we find as investigations proceed. We also have an array of manufacturing and post-acceptance test data which will be reviewed in detail. We have asked Chris Pritchet, at University of Victoria, John Tonry, at the Institute for Astronomy, Guy Ratier at ESA, and Murray Fletcher at HIA to act as external participants and advisors in the IQ improvement program. Both Murray and Guy have many years of experience in the testing and evaluation of large optics and have kindly agreed to participate in the upcoming efforts. Guy and Murray were critically involved in the evaluation of our primary mirror while it was being fabricated many years ago and are thus already familiar with CFHT optics on an intimate basis. Chris and John are long-term users of high quality imaging data and will provide critical scientific evaluation and advise. John Pazdor at HIA has also provided valuable input. We will make the evaluation process transparent to the user community, largely through content posted to this web site. Any and all comments on the process are welcome, and should be sent to mpiqi@cfht.hawaii.edu or to Derrick Salmon at salmon@cfht.hawaii.edu … or feel free to call Derrick at 808-885-7944. Residual NW-SE detector tilt removed by tipping MegaCam 0.00037 radians. IQ now acceptable. Effects of primary mirror-to-corrector spacing changes on iq resulting from changes in ambient temperatures remain to be seen. Height of primary mirror in its cell monitored to see if its position correlates with image-to-image changes of iq distribution. No correlation detected. 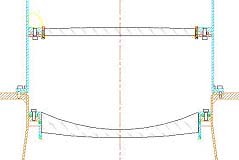 Primary mirror to corrector spacing increased by 3.4 mm, with L3 remaining in its inverted orientation. Extensive optical modelling to determine root cause of off-axis image degradation. Refractive index gradient in L1 a potential explanation. Primary mirror figure errors ruled out. L3 returned to its inverted orientation with an attendant 28 mm displacement towards L2, and limits on focus stage changed to accommodate change in focus. L3 returned to correct design orientation. L3 and its cell accidently inverted in the corrector provided much improved image quality but with a 4.5 mm lower camera focus which precluded some filters from coming into focus. L3 confirmed to be mounted correctly in its cell. Visit by Pierre Kern from Observatoire de Grenoble to loan and operate HASO wavefront sensor. 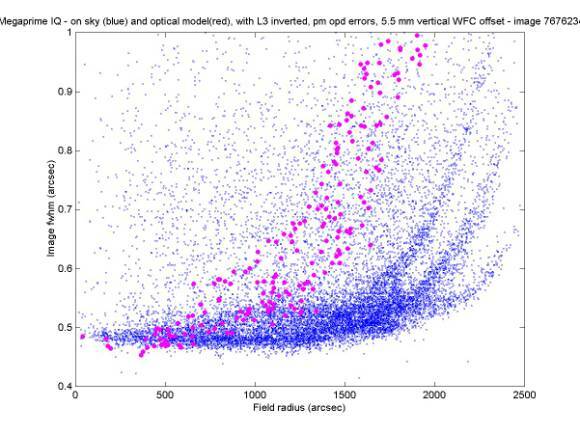 Internal geometry of wide field corrector - lens axial thicknesses and seperations - measured. Spherometer measurements of 8 lens surface radii made using loaned spherometer from Mosaic Optics. Wide field corrector optics re-assembled. L2, L3, L4 and the ISU plate were tested individually for stress-induced birefringence at 0° C and 20°C. L1 was tested previously at both temperatures. L2 and L3 show strong signs of highly localized stress around their circumferances associated with the band of glue beads securing each lens to its cell. These effects appear at both 0° C and 20° C.
At 20° C L3 alone shows signs of glass-to-glue bead seperation over a portion of the surface of roughly a quarter of the glue beads - noteably on the West and SouthWest sides. These effects are not evidence once the lens and cell are returned to 0° C.
Lenses L1 and L2 show strong signs of radially increasing bulk birefringence which is not likely to contribute to imaging problems. At 0°C L1 shows radially symmetric birefringence of the bulk glass which likely results from the slumping process used during glass blank fabrication. No localized mount defects are evident in these tests. L1 birefringence does not appear to contibute to image quality problems. L2 and L3 tested together show what appears to be significant stress-induced berefringence localized near their edges most likely as a result of lens-to-cell mounting problems. L4 and the ISU plate do not show stress-induced berefringent affects. Tests for stress-induced birefringence show significant localized stress the for assembled corrector at 0C. Further test will follow with L1 separated from remainder of corrector in order to identify the optical element(s) responsible. Teleconference with SAGEM to discuss findings and possible corrective actions have started. Discussions of IQ problems held with SAGEM's Roland Geyl and Eric Ruch. Review of wide field corrector mechanical drawings suggests that a large 'O' ring air seal on the cell of lens L1 may contribute to cell mechanical distortion and possibly distortion of L1 itself. Preliminary Hartmann test data and defocused images taken at the telescope. Observations to support explanation of image quality variations with time (Pricket effect) also completed. 753619x.fits focus frame - excellent I.Q., z filter, 30 sec. 753679x.fits focus frame - excellent I.Q., і filter, 30 sec. 749709o.fits no filter 80 sec. 749710o.fits no filter 180 sec. 749711o.fits no filter 180 sec.